Pianist Gloria Cheng will be driving down the freeway (we’re guessing the 5) from her home in the Los Angeles neighborhood of Mount Washington next week to take part in the Pacific Symphony’s second and final “Sonic Kitchen” concert of the season. Cheng is one of the foremost contemporary music pianists in the world — Pierre Boulez once faxed her a piece in the middle of the night; she’s won a Grammy — and she’s being brought in to perform in a demanding program of new music which will include pieces by Frederic Rzewski, Philip Glass, George Crumb and others. The concert is a musical supplement to the Orange County Center for Contemporary Art’s “Art as Protest,” an exhibit featuring a provocative array of visual artworks that aim to “afflict the comfortable, and comfort the afflicted.” Given the times, it is inevitably political. To which music can quite naturally contribute, Cheng said by phone recently. “So much music is political, whether the message is overt or not,” she said. “I mean even a Brahms symphony is political. I’m reminded of something that my husband said. My husband’s not a musician, and he really dislikes a lot of 19th century orchestral repertoire. Because he hears militarism in it, he hears class conflict in it. 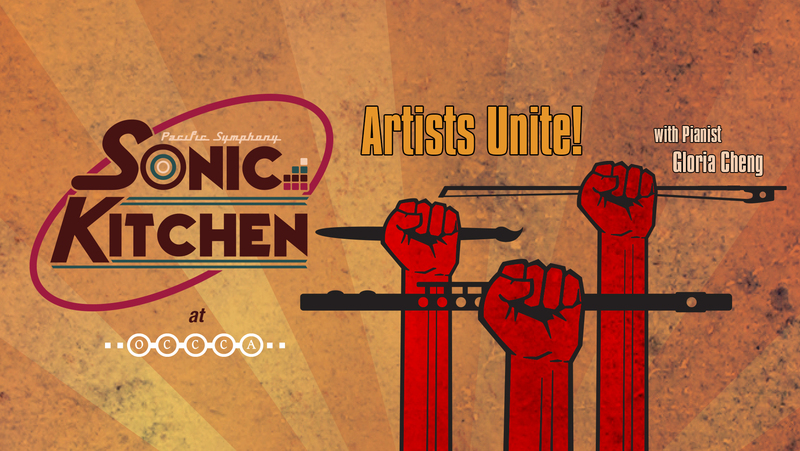 In the “Sonic Kitchen” concert, dubbed Cheng will play a short excerpt from Rzewski’s massive set of variations “The People United Will Never Be Defeated!” based on a popular Chilean revolutionary song. She’ll play the second movement of Glass’s Trilogy Sonata, music from his opera “Satyagraha,” named for the policy of passive political resistance advocated by Gandhi. She’ll participate in a sampling from Crumb’s “Vox Balaenae” (Voice of the Whale), meant to represent environmental concerns. And she’ll play two piano miniatures by Mohammed Fairouz whose titles explain the nature of their protest — “For Syria” and “America Never Was America to Me.” Members of the Pacific Symphony will add Michael Daugherty’s string quartet called “Sing, Sing: J. Edgar Hoover,” which includes tapes of the FBI director’s voice. Singer Carver Cossey will also appear to perform spirituals. The concert is held in the Center’s galleries. Listeners can view the exhibit before the event. Cheng has been lately involved in less overtly political fare, her latest CD “Montage,” a collection of pieces written for her by film composers, and the documentary that was shot at the recording sessions. With those two pieces in hand, she decided, as an Angeleno, she was well placed to find some other film composers who wanted a break from writing film music and quickly found several takers. The striking collection includes, in addition to pieces by Broughton and Williams (who added to his Tanglewood encore), music by Michael Giacchino, Don Davis, Alexandre Desplat and Randy Newman. When she found that the composers could make it to the recording sessions (one came to her home), she started a Kickstarter campaign to fund a documentary. “We overfunded and I made the film with the help of some wonderfully talented people” — friends and friends of friends, including the nephew of a neighbor, and co-producer and cinematographer Joey Forsyte, who just happens to be the sister of Pacific Symphony’s president John Forsyte. The film has made the rounds at about a dozen film festivals, won some prizes and was recently aired on PBS SoCal. Cheng watched it yet again. Cheng says the challenge of performing contemporary music drew her to it. Her polyglot upbringing, she feels, also had something to do with it. “I grew up in a household where my parents were speaking Shanghai dialect to each other, Cantonese to my mother’s side of the family and Mandarin with their friends. None of which we were privileged to have a chance to learn while growing up. And so I’m accustomed to hearing languages about which I don’t understand the specifics. I learned to try to figure out what they were saying by means of their gesture, their tone of voice, their inflection, and the expressive content of what they were saying. There is a certain risk, of course, in performing music that’s newly minted. There’s no guarantee that Cheng will like every piece she has committed herself to perform. “You make friends with a piece for the amount of time that you need to spend with it. When you commission, even when I tap someone whose work I really admire, and then we see the piece several months later, I may not connect with it, it may be different from what I was expecting. Pre-concert: The exhibit opens at 7:15; beer and wine will be available for purchase. This entry was posted in classical music, feature, Video and tagged Gloria Cheng, piano by pacificsymphony. Bookmark the permalink. Great blog! I’m looking forward to Sonic Kitchen and this was a great read to prepare me for it. Thanks Tim. The last paragraph was a soothing balm to my composer’s heart. Thanks for the interview!